The cool of a connection with Nordic climes no longer holds critical water, so bands such as Je Suis Animal (who hail from Norway via Britain) need to make sure they have tunes enough to please – music accentless or otherwise. What’s more, it’s crucial that those who distribute the critical water find a new way to describe music from these areas, no more ‘icy tones depicting the landscape of the music’s gestation…’ rubbish. In truth, Je Suis Animal sound like they could be from any number of places, each of them interesting and indicative of keen musical minds at work. Though much of Self-Taught Magic From A Book is uncomplicated, the band have made the excellent and rewarding decision to factor in just enough experimentation to pique the interest and make a second listen necessary. The angular homophony of It’s Love initially recalls something an awful lot harsher and duller than one might expect, but the cutesy juxtaposition of the most Stereolab-sounding (location #1: France) chorus makes the slog of the verse worthwhile – a rare example of the incongruous verse/chorus divide working well (for an example of the opposite, see Pink’s recent chart-topping single So What). Indeed, the following track (Amundsen) recalls Stereolab’s debut LP, Peng!, with its quiet, epic guitar fuzz, but where the Franco/Anglo ensemble battered the listener with texture and force, Je Suis Animal prefer to mangle dynamic levels. This is not necessarily as effective as Stereolab’s methods, but it at least shows a willingness to vary and a feel for the inextricable links between listener reaction and artistic decision. The quirky vocal timbres of Deerhoof and their fearlessness of atonality are also welcome influences (location #2: USA/Japan), as are the frenetic pace and attractive notion of ragged female delivery found in Love Is All’s punkier moments (location #3: Sweden). The Pastels (location #4: Scotland) are also a sonic signpost, particularly on the electric opener Secret Place – pay particular attention to the excellent hairpinned drumming over the middle eight and the almost-too-shrill guitar lines. The only real issues arise when the line between influence and theft is occasionally fudged, but for the most part Self Taught Magic From A Book remains a bracing affair that, despite the press release’s determination to cement the band to a location and implied heritage, has the occasional delight to offer. 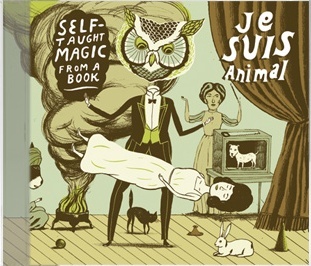 Self-Taught Magic From A Book is released on Angular Records on November 17th.